NEW YORK — Ice cream, candy and soft drinks helped make Warren Buffett a billionaire. Now a subsidiary of his Berkshire Hathaway Inc. is seeking to profit from pot. The entreaty coincides with increasing acceptance of marijuana in the United States. Two states, Colorado and Washington, legalized possession and recreational consumption, and are among 23 where it can be used as medicine. It’s banned under federal law, and banks have said they won’t work with the industry until it’s legal nationwide. 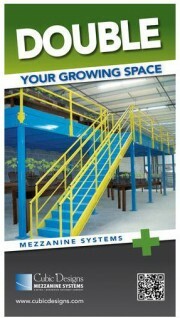 Cubic Designs spotted the opportunity after a few pot growers approached the firm about its platforms, or mezzanine systems, according to Shannon Salchert, the company’s marketing coordinator. Warehouse space has gotten tight in places like Denver, where growers are looking for facilities to cultivate their product. That demand has allowed landlords to raise prices. “We sold a few mezzanines into that market and decided internally, ‘Why don’t we do some marketing? '” Salchert said in a phone interview Friday, Sept. 12. One challenge has been locating growers, because they don’t advertise their names or whereabouts, she said. The fliers were instead sent to dispensaries in states including Colorado, Washington and California, with the hope that they’d be passed on to people who might find a use for the product. Cubic Designs also has considered working with real estate agents who help growers find space, she said. Buffett, 84 and the world’s third-richest person, amassed his fortune through Berkshire’s acquisition of companies such as Dairy Queen and See’s Candies, and by taking leading stakes in others, such as Coca-Cola Co. He’s known for giving the dozens of units at Berkshire autonomy to run their operations. Buffett didn’t immediately reply to a message Friday sent to his assistant.